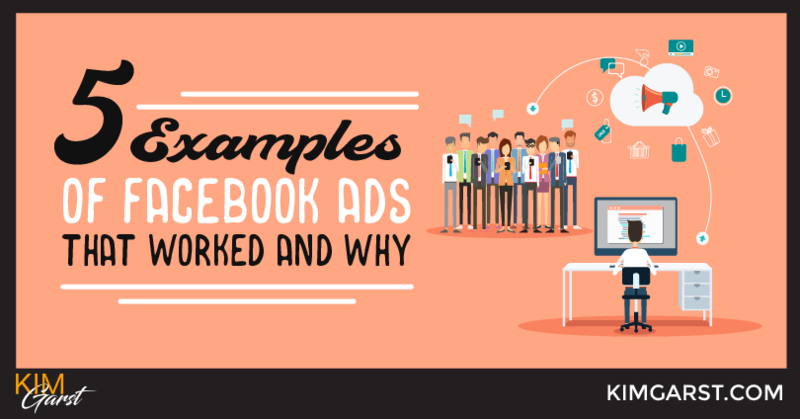 Facebook ads can be an extremely powerful way to reach more people on Facebook. Here at Boom Social, Facebook ads are a key part of our marketing strategy. They help us drive traffic, leads and sales, and give us a way to get our products and offers in front of a larger (yet still targeted) audience. We have found the trick to seeing these results is to promote our free offers – for example, our free eBooks, guides, checklists, etc. This post will show you 5 of our top-performing ads for 2016, and tell you exactly why they worked. Feel free to copy our strategy for your own ads, and let us know how they work out for you! 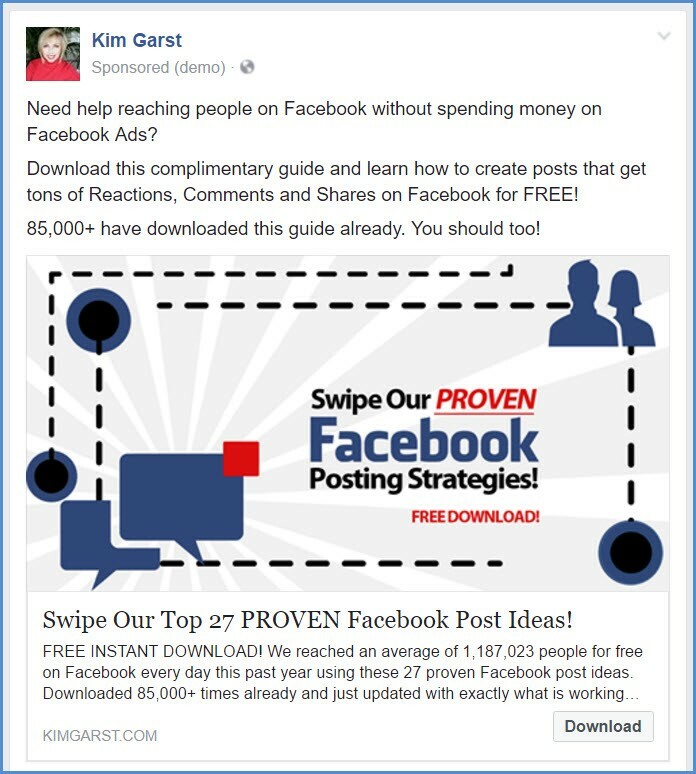 This ad was to promote our free guide, Top 27 PROVEN Facebook Post Ideas. This ad achieved an amazing click-through rate (CTR) of 4.06%, and a cost per conversion of $1.83. Why it did so well: This ad was so successful primarily because it was chock-full of social proof. Social proof is important in your ads, as it assures people that others have already trusted you – this is particularly important when your ad is being shown to people who know NOTHING about you! In this ad, we highlighted the fact that the guide already has 85,000 downloads, and that we achieved FREE reach of over 1.1 million people using the strategies contained within. Another reason this ad got such great results was that the topic applied to every business owner on Facebook. While promoting extremely niche offers can also be very effective, this more general topic seemed to hit the mark for many of the people who viewed it. This was our top performing video ad of 2016. It was viewed 148,000+ times at an average cost of only .01 per view. It was also shared 256 times, which meant additional organic (free!) reach. Why it did so well: As you can see, this ad was extremely simple. Not a ton of text, but the text we did use was clear and to the point. First, we used a link to the offer right within the content for those who didn’t want to view or listen to the actual video. Viewers could quickly see what we were offering, without needing to spend any additional time reading or viewing. Second, the volume icon and bottom third overlay encouraged people to click the graphic in order to listen to the video. Why is this important? According to Digiday, up to 85% of all Facebook videos are viewed without sound. This little reminder not only encouraged people to turn up the volume, it also clearly told them what they would get if they clicked on it: help with creating Facebook posts that would get them tons of free engagement. 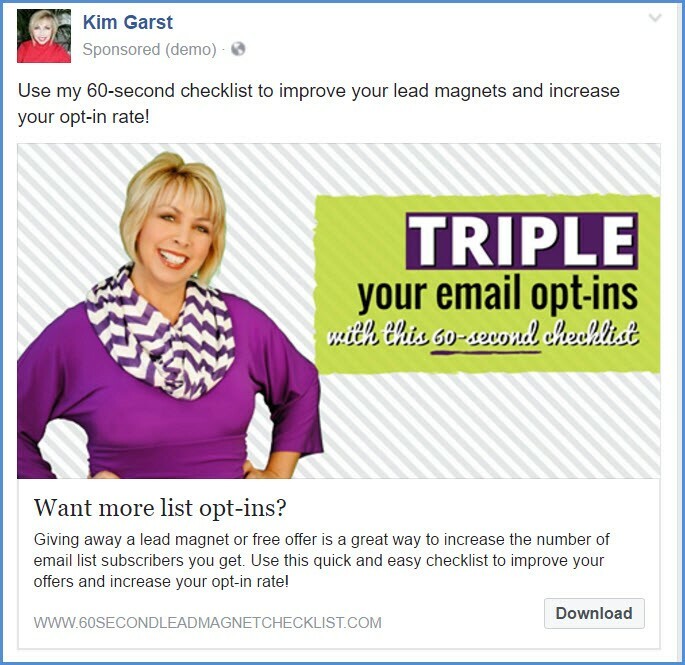 This ad for our 60-Second Lead Magnet Checklist received a relevancy score of 10, which resulted in a cost per conversion of only $1.55. Why it did so well: We took a bit of a different approach with this ad. Instead of targeting a wide array of people, we only showed this one to people who already knew me. This included my Facebook fans and those on my email list. As you can see, we also chose to use vibrant colors and diagonal lines so we could create “pattern interrupt” (where people notice your post or ad because it stands out from others). This choice of colors and patterns helped to ensure the ad got noticed, while also not being TOO annoying. And as you can see from the results above, this strategy WORKED! This ad had a relatively high cost per conversion of $2.83, but ultimately led to the highest ROI of any of our funnels. This is because it took people to an upsell (meaning a higher-cost product), which converted at a staggering 14% for the entire year. Why it worked so well: Given the higher cost per conversion for this ad, it may have been tempting to say, “This costs too much!” and just give up. However, we stuck with it, and it turned out to give us an extraordinary ROI! The point is this: even if it may cost you a fair bit to advertise in a competitive niche, stick with it for a while to see what the return is. If your ROI is good, it justifies the larger investment! 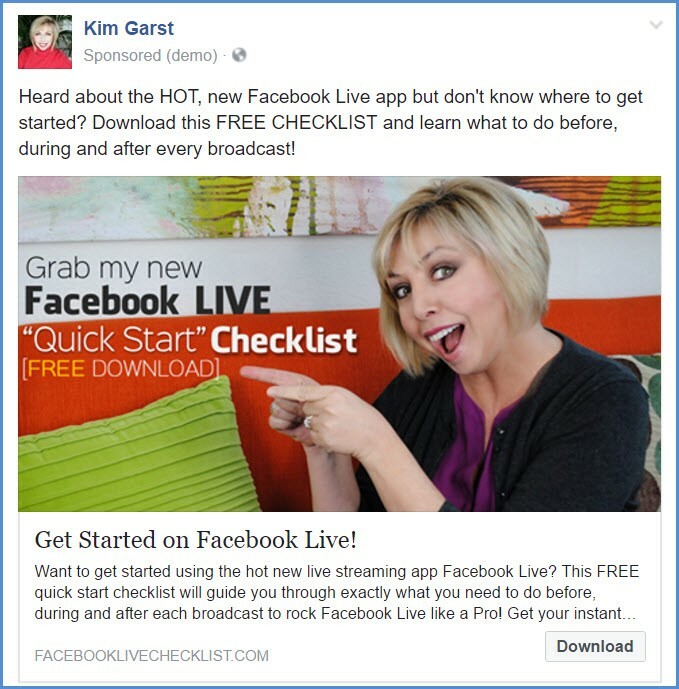 This ad for our Facebook Live Quick Start Checklist had our highest click-through rate of 2016 at 4.34%. It also had a cost per conversion of just $1.48. The second reason this ad did so well is that we managed to hit on an immediate need. Facebook Live had just come out so there was a lot of buzz about it. The problem was, most people knew very little about it. We recognized this need, created a comprehensive yet simple quick start guide, and got it out there ASAP. As you can see from the examples above, each of our ads performed slightly differently. Some helped us achieve higher reach and views, others got us amazing ROIs, and others helped us get record-high click-throughs. However, because we were testing and tracking as we went, we knew exactly how well each ad was performing. This meant we could replicate our results again and again with similar results each time. Will you try using any of the strategies above in your own ads? If so, which one(s)? Share below! 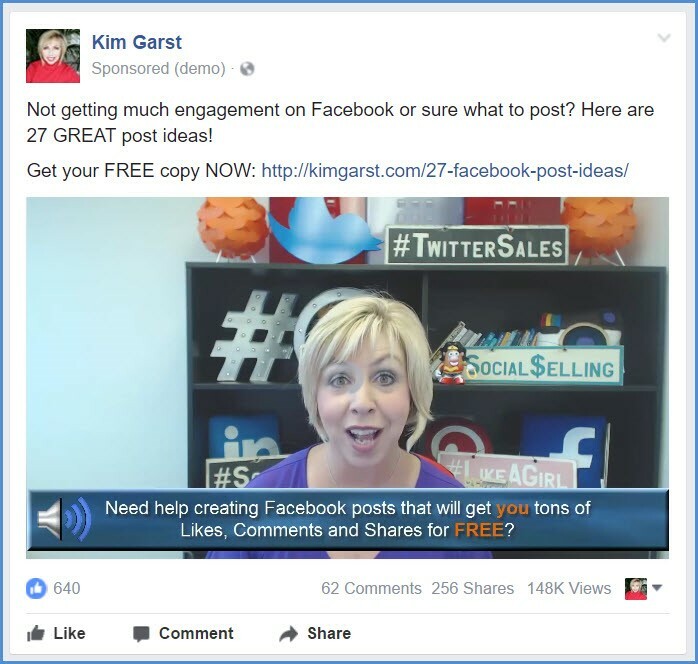 Kim, I just LOVE this comment – As you can see, we also chose to use vibrant colors and diagonal lines so we could create “pattern interrupt” (where people notice your post or ad because it stands out from others). This choice of colors and patterns helped to ensure the ad got noticed, while also not being TOO annoying. As someone who is into visuals and visual communication a lot, I find this conclusion one really valuable tip, when designing visuals for Facebook ads. Thanks for your insight. Hope it works well for you, Jorge! Hi, Kim! I’m loving your blog, the articles. Your tips and ad ideas for Facebook are great, thank you! I’ll test here! Glad to help and hope they work for you! Wow – the pattern interrupt makes so much sense – and it is really effective in the examples you included. This is such a simple thing to implement. Thanks for the insights! 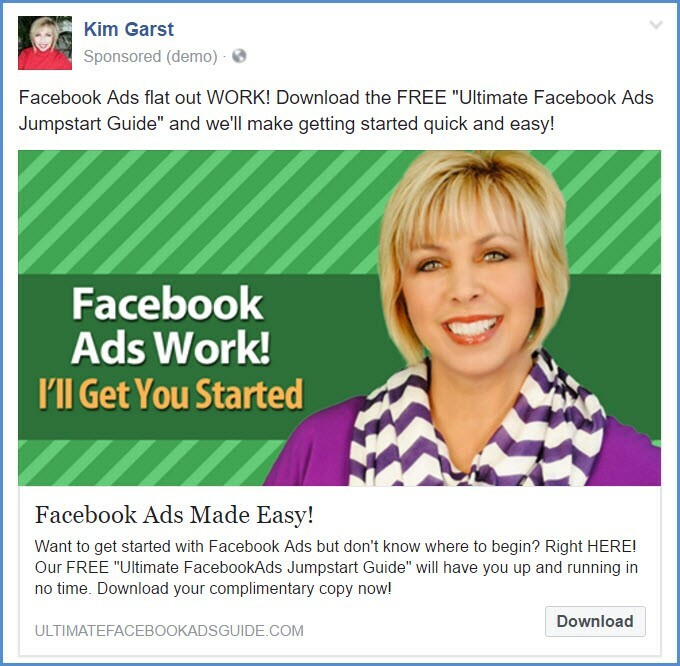 Great info for someone just learning FB ads! Thanks! Advertising on facebook is an art. Thank you for the tips. Facebook adds has helped many to make some money. Its good that it worked. I have become a big fan of your websites. Great info for someone, very good!! Look what Yvette Owo just posted..Hello world! Hi, Thanks for sharing this great learning resource right now I am gathering knowledge about FB ads because I have to run a campaign.